EU Regulation 2009/72/EC concerning common rules for internal market in electricity calls upon 80% of EU electricity consumers to be equipped with smart metering systems by 2020, provided that a positive economic assessment of all long-term costs and benefits to the market and the individual consumer is guaranteed. Understanding the impact that smart metering systems may have on the electricity stakeholders (consumers, distribution system operators, energy suppliers and the society at large) is important for faster and effective deployment of such systems and of the innovative services they offer. 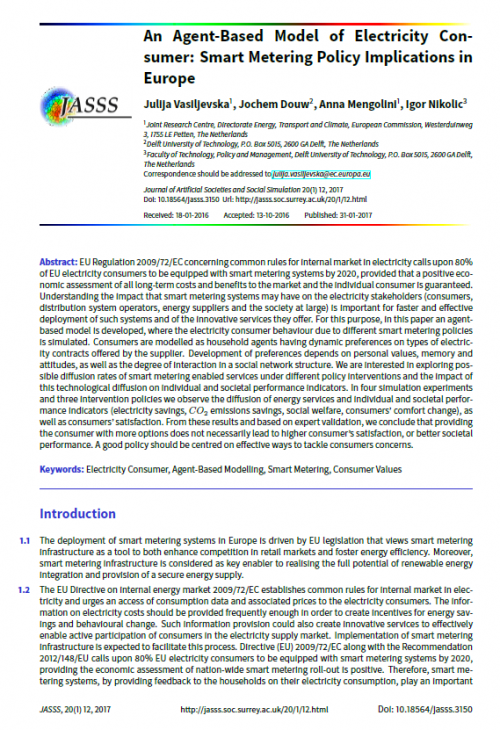 For this purpose, in this paper an agent-based model is developed, where the electricity consumer behaviour due to different smart metering policies is simulated. Consumers are modelled as household agents having dynamic preferences on types of electricity contracts offered by the supplier. Development of preferences depends on personal values, memory and attitudes, as well as the degree of interaction in a social network structure. We are interested in exploring possible diffusion rates of smart metering enabled services under different policy interventions and the impact of this technological diffusion on individual and societal performance indicators. In four simulation experiments and three intervention policies we observe the diffusion of energy services and individual and societal performance indicators (electricity savings, CO2 emissions savings, social welfare, consumers' comfort change), as well as consumers' satisfaction. From these results and based on expert validation, we conclude that providing the consumer with more options does not necessarily lead to higher consumer's satisfaction, or better societal performance. A good policy should be centred on effective ways to tackle consumers concerns.